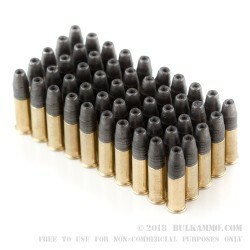 When it comes to versatility in application, there is no greater round than the .22 long rifle. 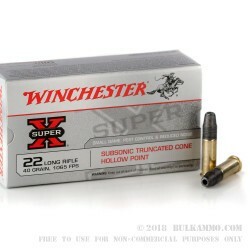 The WInchester Super-X 40gr .22 long rifle lead hollow point gives you the power to achieve that application, at a price that will have you coming back for more. 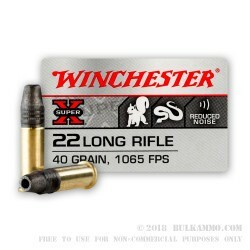 The Winchester Super-X 40gr .22 long rifle lead hollow point has a velocity of 1,280 feet per second, and will allow you to engage targets out to 100 yards accurately and consistently. 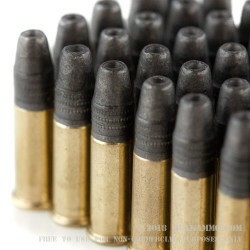 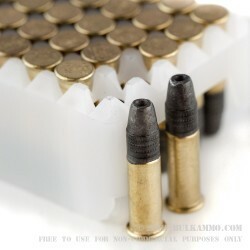 The lead hollow point round is economical for target shooting purposes, and has superior bullet weight retention and when compared amongst other jacket soft point rounds. 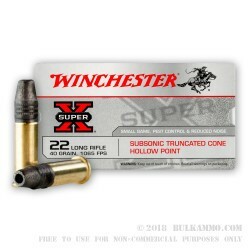 Ideal for killing varmints such as snakes, possums, and raccoons, the Winchester Super-X .22 long rifle lead hollow point is a stable on farms all across America. 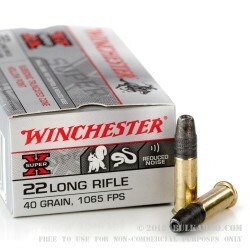 If you are looking for truly economical round without having to sacrifice performance, the WInchester Super-X .22 LHP is an ammunition that you need to have riding shotgun.